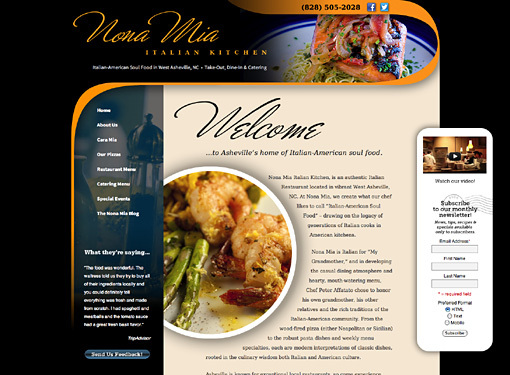 Nona Mia is an intimate, informal, and very popular Asheville restaurant specializing in “Italian-American soul food.” Chef-owner Peter Affatato wanted a modern website that would be geared not only to the local market which throngs his restaurant, but also to the millions of tourists who visit Asheville every year. MarketDigita created such a website using WordPress, making it easy for Nona Mia to update menus and post notices on their blog, and a sister website dedicated exclusively to catering at NonaMiaCatering.com. In addition, MarketDigita also handles SEO, Social Media Marketing, and Online Reputation Management for Nona Mia.